I’ve been asked many times about how I go about shooting portraits. I normally remember an old quote by Abraham Lincoln which goes “If you are given 8 hours to chop down a tree, spend the first six sharpening the axe” or something along those lines. In my case though, I would spend the same proportion of time talking to the person and getting familiar with him or her before popping the all too familiar question “Can I take a picture of you?” It is very often the last question I ask as opposed to the first when I wish to take someone’s picture. The rewards are twofold. One, you get to know about a person and his or her lifestyle and two, is possibly a beautiful picture that reflects good rapport and perhaps great expressions as well. Even if the answer to that last question is no, you walk away a little bit more enlightened about a person’s life. No doesn’t mean never, its merely “No, not yet or not today”. And that is exactly what I was trying to do with Mr. Satumat when I first met him outside his home in Cemoro Lawang Indonesia. This post has a sad ending to it so if you’re not prepared to read on, just look at the pictures and move on I guess. I visit Mt. Bromo almost every year as part of the travel photography workshop I conduct there for a small group of photographers. 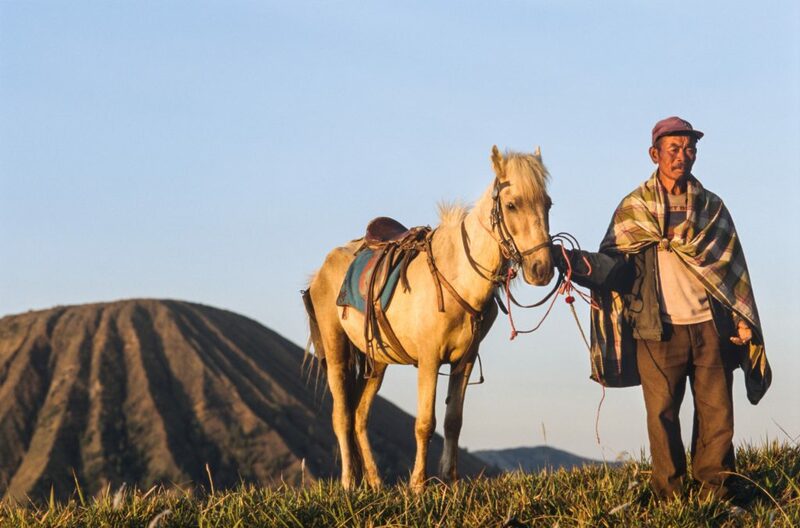 While the main focus of the workshop is capturing landscapes and night sky photos, we also allocate a short session for portraiture, mainly of the Tengerrese horsemen who are the indigenous people living in Cemoro Lawang, East Java. This additional component came about after I met one of them outside his house and chatted with him using the 20 or 30 Indonesian words I knew back in 2012. 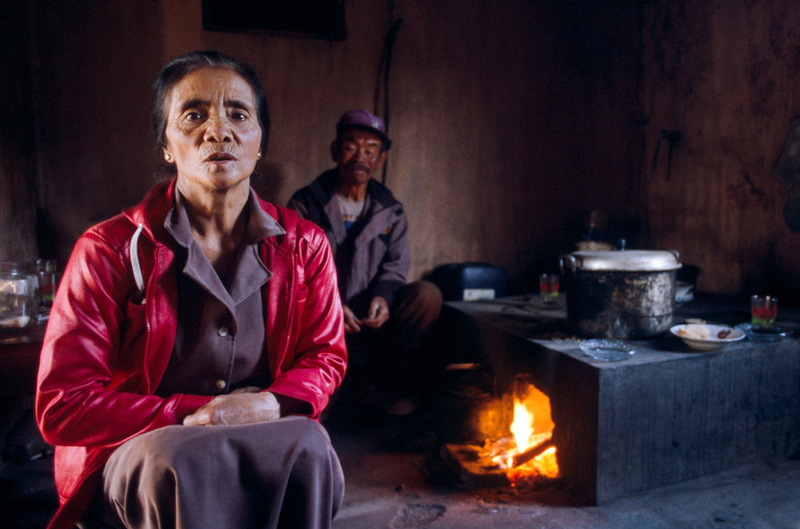 The following is a set of photos from that encounter with Mr. Satumat, the horseman from Cemoro Lawang. I saw his horse outside his house and took some pictures of it when he came out and smiled. I greeted him with an “Asalamualaikkum!” which really was not the proper greeting as I would find out later. I quickly asked him the name of his horse and how old it was in terribly broken Indonesian as the sun was rapidly descending behind him. I also asked him about his family and the number of kids he had. 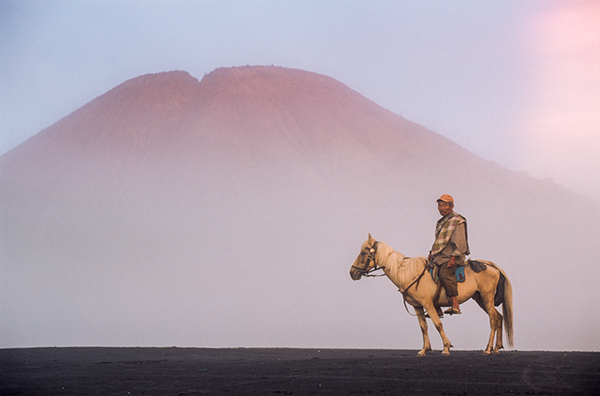 I ended the conversation asking him if he could meet me the next day and walk with me to Mount Bromo. He told me that was possible but it would be quite a walk (about an hour or so). 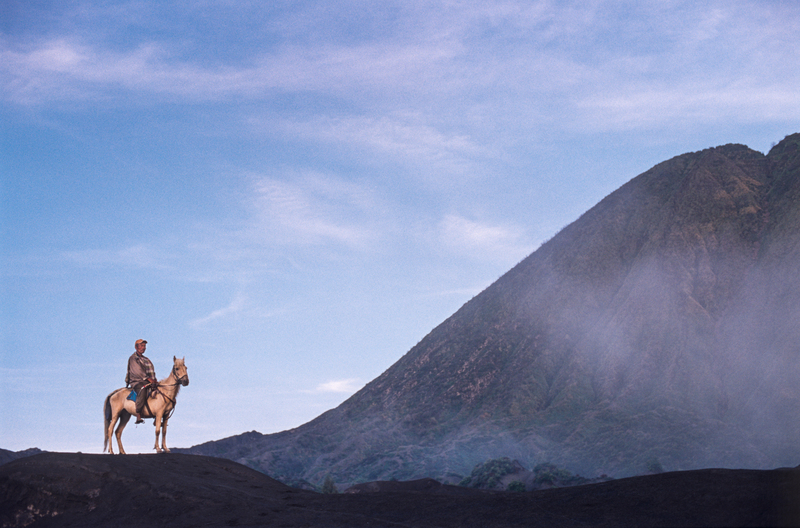 Most people take a jeep to Bromo and only complete a small portion of the uphill climb on horseback. And smack on time the next day I saw him outside his house and he was all set with his horse. Now shooting on film meant that I could not shoot anything for the first hour on the way there as there was just too little light and the flash would not have been a good option. So I chatted about a lot more things on the way there and he was very puzzled that I was not sitting on the horse but walking alongside him. He kept asking me to mount the horse but I politely refused preferring to walk alongside him. We managed to talk about everything from how long it took to get from Singapore to Mount Bromo to the exchange rate of the Sing dollar with the Indonesian Rupiah. All this with just 20-30 words I knew in Indonesian. I only understood 10 percent of every question he answered but it was still enlightening. 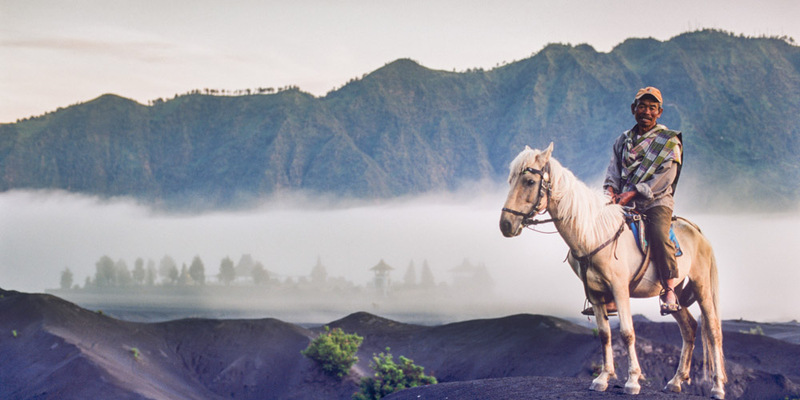 We walked through a cloud covered caldera so visibility was poor but when we climbed to three quarters the height of Mount Bromo we were above the clouds and I immediately asked him to stop in his tracks and mount the horse which resulted in the picture you see below. Somehow I was emancipated from all the frustration that was building up with the lack of light and the abundance of clouds. So I went trigger happy when I got to see him without the cloud cover. As we walked back, the clouds were still around creating a rather surreal mist and I had some issues locking focus on him but with patience (on his part) and some teeth grinding (on my part) I managed to get a couple of shots more. I thought I had some adequately interesting shots of him but this already interesting encounter was to get better. He walked back with me and invited me to his house to meet his wife. I had paid for a ride to the mountain and back and now I was being offered coffee and biscuits. It was really nice of him so I went in and met his wife who was very happy to pose with him for the shots below. They were really chatty and told me many things about their plantations (I only understood about 10 percent of every thing they said but it was fun nonetheless). From what little I understood, they had a small plantation for onions and cabbages and it was not easy getting money to build his (rather big) house. He then told me most people in Cemoro Lawang were Hindus so they do not greet using “Asalamualaikkum” as the rest of the Indonesian Muslims (and Muslims the world over) do. They say Om Swastiastu. 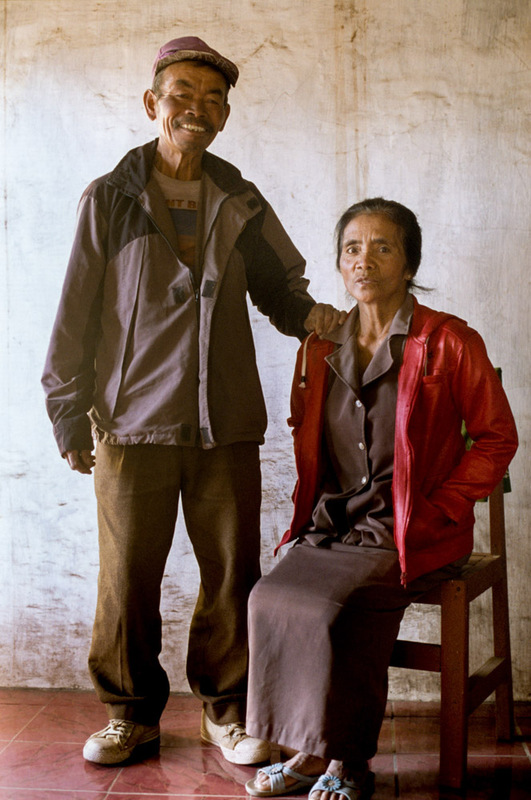 Fast forward to two years later, my colleague Yiren and I came back to Cemoro Lawang to pass Mr. Satumat his photos and I was excited to show him all the photos you see above. We knocked on the door and his wife opened the door. She recognised me, smiled and asked me to come in. I asked her if her hubby was around and she mentioned something about going away and something about the number 5. Now Yiren speaks good Malay (a close cousin of Indonesian) but even he couldn’t understand what she was saying. We thought he would be back at 5pm so we said we will come back at 5pm to pass him the photos. It was then she used the word “mati” which both Yiren and I immediately recognised for it meant dead. Then the words “Bulan Lima” made sense as well. Mr. Satumat had passed away on the 5th month (in the month of May 2013) and thats when we saw her eyes welling up. We thought he would be back at 5pm so we said we will come back at 5pm to pass him the photos. It was then she used the word “mati” which both Yiren and I immediately recognised for it meant dead. I passed her the photos and she eagerly took them from me staring at the shot of both of them for a considerable while. While I was so happy having spoken about so many things with Mr. Satumat two years back, I was totally frustrated at not being able to express my condolences on the bereavement. All I could manage was “Aku minta maaf” (I am sorry) and that too possibly was not grammatically correct. Both, Yiren and I walked back grief stricken by what we just heard. She also told us the horse was still around and that her son rode it these days. 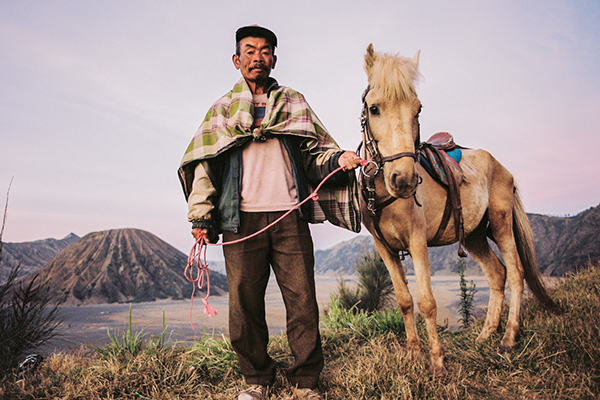 So every time I go back to Bromo, I visit his son and get my participants to use his horses for going up the mountain. The least I can do for a sweet old man who walked with me and brought me to his house for coffee and biscuits. Goodbye sir, you are missed in this world.